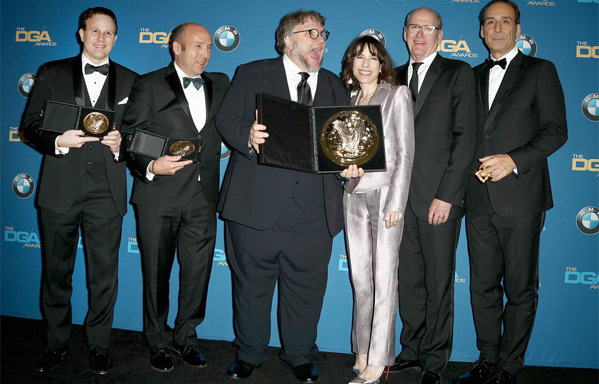 Over the weekend, the winners of the 70th Annual DGA Awards were announced in Los Angeles. Continuing his awards streak, Guillermo del Toro was this year's bigger winner, taking home the main prize for Best Director of The Shape of Water (he also won Best Director at the Golden Globes, as well as Best Film at the Producers Guild Awards). In addition to del Toro, Get Out director Jordan Peele won the award for Best First Feature. And City of Ghosts director Matthew Heineman won the award for Best Documentary. The Directors Guild Awards are one of the top awards in Hollywood, and it's exciting to see these two talented filmmakers winning. Congrats to both Guillermo and Jordan, both outstanding winners for their fine films. For the 70th annual DGA Awards honoring films from 2017, The Shape of Water's Guillermo del Toro beat out fellow director nominees: Greta Gerwig for Lady Bird, Martin McDonaugh for Three Billboards Outside Ebbing Missouri, Christopher Nolan for Dunkirk, and Jordan Peele for Get Out (who went on to win Best First Feature anyway). All of these nominees are deserving of winning, another strong year of great films. As for the Best First-Time Feature, Get Out's Jordan Peele beat out fellow nominees: Geremy Jasper for Patti Cake$, William Oldroyd for Lady Macbeth, Taylor Sheridan for Wind River, and also Aaron Sorkin for Molly's Game. All of their films worth seeing if you haven't watched them yet. Congrats to all of the nominees and honorees from 2017. Coming up next - the Academy Awards are on March 4th. The previous six winners of the main Directors Guild Award prize include: Damien Chazelle for La La Land, Alejandro González Iñárritu twice for both The Revenant and Birdman, Alfonso Cuarón for Gravity, Ben Affleck for Argo, and Michel Hazanavicius for The Artist. The DGA Awards have been given out since 1948.